Hey gang! I’ve had some trouble posting over the last couple of days. Sunday evening, my dear friend Mr. MacBook decided that he’d had it with me, and shut down for good. I took the little bugger into the Apple store yesterday, but considering its relatively advanced age of six (or was it seven?) years and the fact that any kind of “exploratory surgery” would start at around eighty dollars, I decided that I could no longer put off getting a new computer. When I pulled the sorry-looking thing out of my bag and put it on the counter I realized what a state it was in: screen slightly askew, three of the four no-skid cushions underneath missing, dented, scraped and stained, with cat hair stuck in the keyboard (I kid you not). Retirement suddenly seemed long overdue. So, I’m getting a new one in a few days. Meanwhile, I’ll just bring my office laptop home with me. But enough about that and on to the topic of the day. Yesterday, The Beat posted an interview with Mark Waid that really made an impression on me, and which I immediately felt the need to write about, inspired in part by my own experiences. The interview mainly revolves around how depression and mental health issues in general are handled in Daredevil and Indestructible Hulk. I found Waid’s views on both characters very interesting, and admire his willingness to get so personal. He has touched on this topic before, of course, but not quite like this. “Daredevil clearly is dealing with chemical depression issues in his life and, frankly, so have I my entire life. I’ve made no secret of that– and something I learned is like any chronic condition it doesn’t just go away, but what you can do is use cognitive therapy to get past the worst of it. When I first read the part about how Waid views Matt’s depression, I was a little surprised by it. Not by the idea that Matt is, or has been, depressed, that part seems pretty obvious. I guess I’ve just always seen his depression as a very natural reaction to really bad things happening in his life. From all accounts, even his early childhood was rough. He then has to go through losing his sight in a very traumatic accident, experiencing the violent death of his father and, over the years, losing even more of the people in his life that are closest to him. Each event on its own, is something people can and do mentally “recover” from. Human beings are resilient, and most people do find happiness again, even after the death of a loved one, acquiring a disability, or going through other major crises in life. With Daredevil, though, it seems like it’s just one major crisis after another. On the one hand, the impression we have of Matt’s ongoing suffering is a consequence of the decades-long, serial nature of his life story, as his long line of creators have told it to us. Things need to keep happening to superheroes, and much of it is bound to be pretty heartbreaking, or else there would be little to read about. On the other hand, the story of Daredevil still seems more tragic than that of most other comparable characters, and as such it makes perfect sense that feelings of hopelessness, frustration and grief are a natural part of being Matt Murdock. But it seems to me that what Mark Waid is suggesting in this interview goes beyond simply seeing Matt’s fragile mental status as merely an obvious consequence of the life he’s lead. The more I think about it though, the more it makes sense to me that it may in fact be a more basic character trait. What I realized was that there are things about Matt’s approach to life that I can personally identify with. I am certainly not as fearless as I’d like to be, and I will not be bringing any vigilante justice to my home town any time soon. (Though I must admit that I did one time see a bunch of teenagers spraypaint the inside of my train car on the way home after a party, and got so incredibly pissed off I actually googled for local krav maga classes the next day.) What I can relate to is the combination of optimism and despair that is so much what Daredevil is about. If I may get a little more personal than usual, I’ll share some of my own experiences. The way I think of my own mind, when it comes to things like mood and mental well-being, is that there are three basic layers. At the very center is my very deeply held core belief that life is meaningful and good, that there is inner peace and that storms can be weathered. While these beliefs can be challenged by things – good or bad – that happen in life the core is fairly stable and resilient. The next layer up is much more likely to change in response to things going on in life, and these changes operate on a timeframe of days to weeks to months, or even years. The top layer is simply the normal day to day mood swings, the ones that allow you to have a really bad day even while you’re generally happy with life, or a really nice evening out with friends to take your mind off the fact that you’ve been in a really bad slump for weeks. While my “center” has always sustained me, I occasionally go through periods of mild depression, and this has certainly been true over the last couple of years (even though Daredevil’s been better than ever, imagine that! ), and about ten years ago I had a really rough time. I had just moved to Seattle to take a job at the University of Washington, with the intention of permanently emigrating to the U.S., but things started going south right off the bat. I very quickly became convinced that I was underperforming at work (I wasn’t, it was pure paranoia), and everything just started feeling wrong. I was stressed all the time, my already crappy back got worse from my being so tense all the time, and I would wake up every morning in excruciating pain. I then started developing an irrational fear of chemicals (this is not a good things when you work in a biochemistry lab), where I would get it in my head that I had inhaled something or spilled something nasty on myself. Then the panic attacks started and within my first few months in Seattle, I had been in the emergency room twice because of it. Ironically, I always knew what they were, I knew I wasn’t really dying, but the feeling itself was so incredibly disturbing that I didn’t know what to do to stop it. I spent my 27th birthday on Valium. It was only for a few days, and I would have never had it any other way (you do not want to mess with anything in the benzodiazepine family), but I just had to take a break from myself, that’s how wound up I had become. I was a complete mess. What made this time even worse was that it forced me to completely reassess my view of myself. I had always viewed myself as an unusually happy and stable person, the kind that others turned to with their problems. Until then, I had no real understanding of people who were not like me, I couldn’t understand how anyone could be depressed for no real reason. Now I know how incredibly devastating it can be. And that “darkness” is still with me, just as I’ve realized it was always there, ever so occasionally flooding that “middle layer” of mine. But it doesn’t mean that I don’t, at the same time and somewhat paradoxically, see myself as very happy person overall, with a great capacity for finding humor in most things. Fortunately, I more often overcome with joy than sadness, and I’m grateful for that. 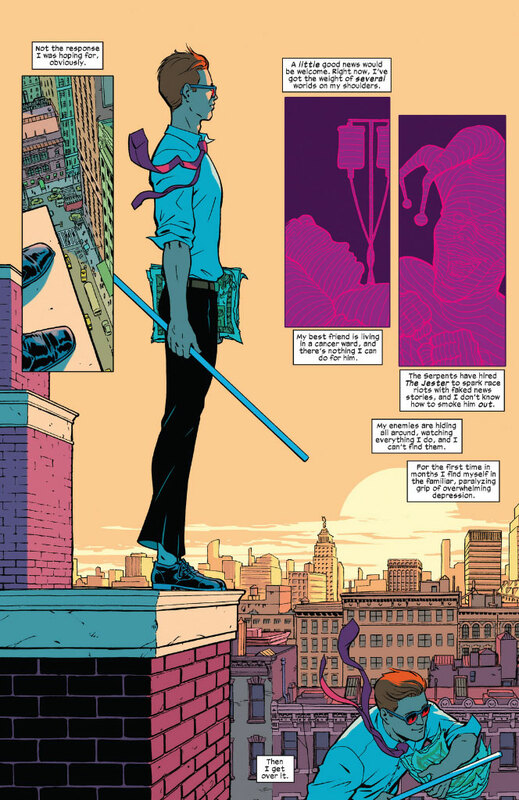 What I recognize in a character like Matt Murdock is that ability to joke, smile and laugh – and do so genuinely, not as a front (or in Matt’s case, perhaps not only as a front) – while at the same time navigating the inevitable slumps and rough patches that you know may be waiting around the corner. It is possible to be both an incurable optimist, to have your “center” propel you forward and give you meaning even while occasionally dealing with feelings that seem threaten to stop you in your tracks. Real people are complex, and it’s a great thing to see creators of fiction let that complexity shine through their characters as well. I’m not sure I meant for this post to be quite so personal, but on the other hand, I also believe in another thing that Mark Waid mentioned in that interview, and that is address the stigma of mental health issues. My friends know about it, and it’s not something I’m particularly embarrassed about. And, if it helps someone realize that they’re not the only one who struggles sometimes, then that’s probably a good thing! I do identify with Matt on a couple of levels. I never thought of Daredevil suffering from depression but having the concept brought up it does make sense. It makes past story lines that I’ve enjoyed resonate on a different level I had never considered. Thank you for sharing your personal experience. From meeting you briefly you are very delightful. I really appreciate the energy you share with us. It certainly increases the fun I normally have with comics! I’m so pleased you posted this. I’ve been through some issues myself, most hard of which occurred last year and I found great strength in Matt’s resolve with his life changes. Some of these issues have given me a great deal of strength so thanks for addressing this.